The second step of the ADDIE model is Design, which often gets schlumped together with the next stage, Development. Design sounds like a lot of fun, and it can be, but there is a lot of attention to detail in this stage that, if overlooked, can make for disastrous results. In the Analysis stage, we determined if training really needed to be done and, if so, who needed to be trained. In the Design stage, however, we are going to focus on the individual steps of that training - everything that it takes to get from Point A to Point B. It can be easy to gloss over little steps that may seem inconsequential, but every action that a learner must take to get to the end result is necessary and should be included in the Design stage. Within this stage there are two main points which need to be addressed - the process and the objectives. As I mentioned, each step of a task should be written down in order for the instructor to understand every given step between Point A and Point B. This is the process - the path that the learner must take in order to complete a task successfully. There are two main ways to write down the process - by outline or flowchart. In the past I have used Outlines to help me pinpoint the exact process a learner will take to successfully achieve the goal, but this past semester I was introduced to flowcharts in all their infinite glory. 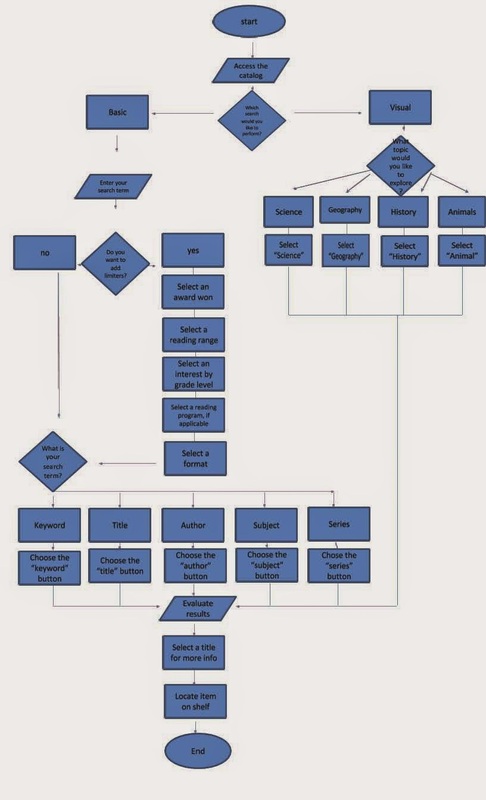 The beauty of a flowchart is its ability to detail actions in a much more visual way. So, when I put together a 15 minute tutorial for grades 3-5 on how to use the school library catalog, it was important to write down all the steps a student would take to search for a book. So often we complete tasks without thinking of all the steps it takes to complete the goal. For example, there is more to using a catalog than typing in a word and hitting the “search” button. First you must decide on a search term, then you must decide what type of search term this is (author, title, subject, keyword, etc,) and then, after hitting submit, you must evaluate the results to determine which item is the most closely associated with the subject you are looking for. It is a task that librarians do everyday and, as simple as it may seem, when you break it down there are a few complex areas which need to be addressed. A flowchart will help you break down each step and identify where pain points may occur and, as you can see from the image above, there can be many pain points for the smallest of tasks. The Learner will be able to perform a basic search using the Destiny Integrated Library System and successfully locate an appropriate title based on reading and interest level. i. Using a subject matter chosen by the instructor, the learner will select search terms, in order to limit search results based the appropriate reading level. ii. Given the Destiny ILS, the learner will input the search term into corresponding field in order to limit search results. iii. Using the Destiny ILS and the subject matter chosen by the instructor, the learner will evaluate results to further limit materials appropriate to their reading level. iv. Based on the search results, the learner will select an item that meets the criteria for both the subject matter and the reading level. Once you've got your flowchart and your objectives, you have a pretty solid road map for your instruction. With your road map in hand, you can now move on to the best part of the ADDIE model - Development.